T315 (Maunal Fill, 10kg, Free Delivery). Introducing the incredibly popular 11kg ice maker from best-selling brand Polar. 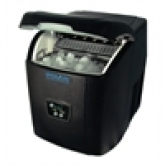 Convenient, compact and simple to use, the Polar is one of the most user friendly commercial ice makers available. Simply manually fill the internal reservoir, select the size of ice and then wait for fantastic bullet shaped ice, easily removed with the supplied scoop. Ideal for small restaurants, cafés, pubs and bars who require a compact and stylish manual fill ice machine. G620 (Manual Fill, 15kg, Free Delivery) Stylish, well-constructed stainless steel manual fill ice machine from Polar, designed for stress-free and easy operation in bars, cafes and restaurants. No water connection is required - simply lift the lid, fill the water reservoir and fresh ice will fill the internal removable basket (holds approximately 120 cubes). The front panel allows you to select the different sizes of ice as required. Supplied with scoop. T316 (Auto Fill, 20kg, Free Delivery). The Polar 20kg Commercial Ice Machine is a high quality reliable ice maker from leading brand Polar Refrigeration. Boasting a compact, easy-clean stainless steel design, the commercial ice machine is perfect for front of house ice dispensing in bars, pubs and other similar establishments. Featuring robust construction, it's designed to withstand rigorous commercial operation, whilst the user friendly control panel is simple to use and provides clear, concise feedback on the status of the machine. Supplied with installation kit and handy scoop. 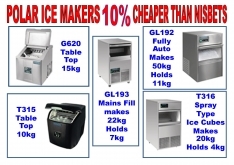 GL192 (Auto Fill, 50kg, Free Delivery) Perfect for use in pubs, clubs, bars, retail outlets and other similar premises, the Polar Refrigeration Bullet Ice Maker offers high output ice making alongside a large hygienic 11kg ice storage capacity. Made from robust stainless steel, it's designed to be strong and durable, whilst also being incredibly simple to use and clean. A fuss-free high output ice machine from Polar, supplied with a scoop and mains water connection kit. GL193 (Auto Fill, Spray Ice, 22kg, Free Delivery) You can make long lasting, crystal clear ice with the mains fill Polar Spray Ice Machine. Customers will really notice the difference as the ice produced by this machine is of the highest quality, perfect for adding to premium drinks or for crushing. Able to produce up to 23kg of ice every 24 hours, the Polar ice machine is ideal for pubs, clubs, bars and other similar establishments. It's also made from strong stainless steel which is easy to clean and highly durable. Supplied with scoop and mains water connection kit.